Resource Tuner: A Resource Editor Hacker Grabber for PE files. Open and Edit DLL Files, Change Icons in EXE Files. UPX Unpacker. The DFM Editor now supports viewing and editing forms encoded in UTF-8. Bugfix: Resource Tuner failed on WiX based setup files. .QTR (QuickTime Resource) file extension added to the Open File type list. Fixed the font scaling issue in the Resource Properties panel. Resource Tuner is Windows 10 Ready. Added the Favorite Files menu item to display a list of favorite files for easy access. Added the option to add support for Windows 10 platform in the Manifest Wizard. Bugfix: Attempting to save a newly created resource file occasionally caused an error. A number of other minor bug fixes and improvements. Added the Find command to search for text within resources. Fixed the interface scaling issues. Bugfix: Error in the Dialog Editor caused corrupted controls and loss of strings. Bugfix: Error in the DFM Editor occasionally caused loss of unsaved changes. Bugfix: Repeated save operations caused corrupted files. The Plug-in Manager now supports plug-in chains (i.e. plug-in processing does not stop after 1 successfull pass, and other plug-ins can be called). Resource Tuner now is Windows 7 Ready. Now Resource Tuner reports an error when opening 64-bit files. Support for 64-bit files will only be available in version 2. .MUI (Multilingual User Interface) file extension added to the Open File type list. Added the options to create the Windows 7 Compatibility and DPI-Aware sections in the Manifest Wizard. Added the option to specify the processor architecture in the Manifest Wizard. Bugfix: Fixed an error that occurred when the last item of a menu to be edited was a separator. Bugfix: The conflict with third-party applications on Windows XP SP3. 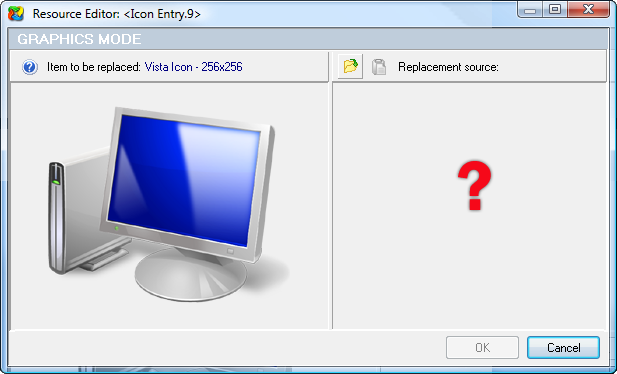 Bugfix: Windows Vista was occasionally unable to recognize the resources in files manifested by Resource Tuner. Improved opening of huge files (of 1 Gb or larger). Bugfix: Fixed an error that occasionally occurred when editing menus. Bugfix: Resource Tuner reported negative values for the total physical memory under Vista SP1. An improved algorithm for the resource editing engine, which makes it possible to work with non-typical PE files. Added the Reload Last Opened File button. Now prompts to remove missing files from the Recent File list. Now supports for UPX v3.01. Now supports for LZMA compression method. Now Resource Tuner is Vista Ready. Fixed issues with the Vista Thumbnail Preview and Flip 3D features. Now supports replacing large (256x256) Vista icons stored as .ICO with an icon from a PNG file. 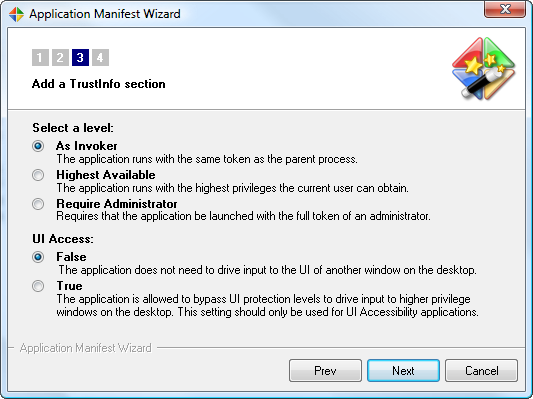 The Manifest Wizard now supports marking a Pre-Vista application with a requested execution level. Now supports unpacking of files packed with many UPX scramblers such as Advanced UPX Scrambler, UPoLyX, UPX Lock, and more.